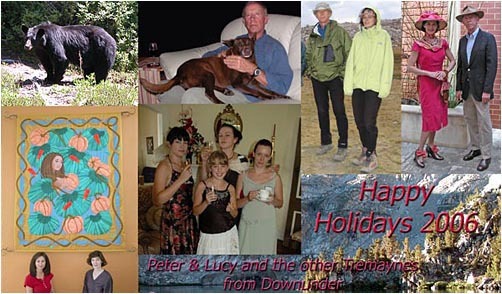 From the Christmas of 1995, Peter and Lucy have produced an annual collage of photographs that best represents their activities during the previous year. Many of these photographs have outdoor settings, in particular, mountain scenery. This is to be expected as most of our time in the USA has been spent climbing or hiking the numerous peaks of the Oregon/Washington Cascades and the Californian Sierra Nevada. Another trip to New Zealand to attend a Vietnam Reunion [41 Squadron] and more hazardous hiking on the South Island. Also to Western Australia for a return hike along the beach sections of the Bibbulmun Track with grandson, Regan. A heavy snow year at the house and in the High Sierra, that limited our annual hiking on and off the JMT, but spent time in Zion NP and the PCT south of Mt Whitney. A trip to New Zealand in March & April to hike sections of the Te Araroa Trail from near Nelson to the Travers Saddle on the Sabine Circuit. Hiking 500 miles in the Sierra Nevada, included the annual hike along the John Muir Trail in September with Bob Williams and Mike Fox from Australia, and a section with Benjamin Spillman. Also another great off-trail section of the Sierra High Route with Bob. A trip to New Zealand and Western Australia to see Peter and Annette's first great-grandchild [Jordan], son of Jessica Tremayne. Peter hiking 600 miles in the Sierra Nevada, included the annual hike along the John Muir Trail and climbing adventures on the Sierra High Route with Bob Williams. 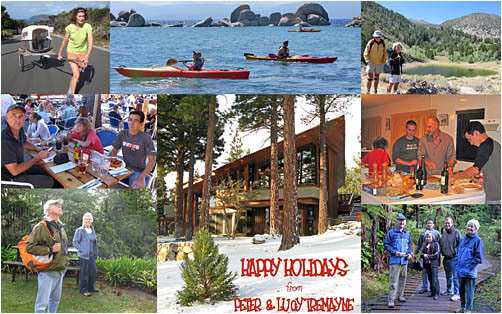 A busy year in the Sierra Nevada mountains with appearances from Johannes, Big Rob and Jeanne. Also found: New hiking buddies from Reno ... Bob Williams and Benjamin Spillman. Lucy again busy with Nursing School and working as a Nurse Assistant at Renown Hospital, Reno. Two international travel trips for Peter: During March, to New Zealand for an Air Force Reunion and to Australia in November for granddaughter, Jessica's, wedding. Lucy busy with Nursing School throughout the year. Peter hiking 450 miles in the Sierra Nevada, included the annual hike along the John Muir Trail. This year with two titanium knees! A simple card for an unremarkable year. 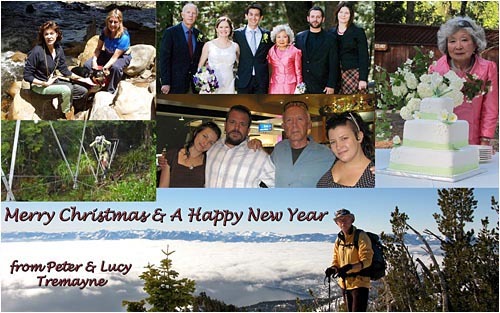 No international travel, Lucy busy with Nursing School and Peter hiking 430 miles in the Sierra Nevada with a titanium knee! Peter's hiking included the annual hike along the John Muir Trail. 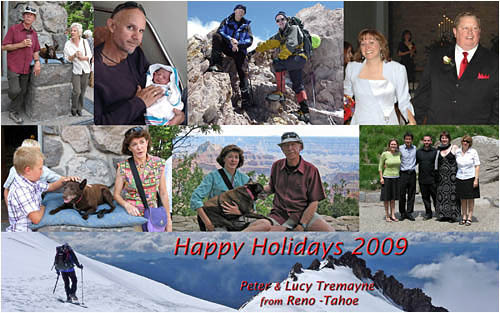 An interesting year in the mountains that included the wedding of Bill and Heidi near Yosemite National Park. Peter spent time in New Zealand, hiking in the rain and attending an Air Force Reunion. Also traveled to West Australia to be with grand kids and old friends at Goode Beach. Another hike along the John Muir Trail ... the 9th in 9 consecutive years. Our third year living in the mountains between Reno and Lake Tahoe. After Ricky's passing late last year, we are now blessed with Mary, an Australian Working Kelpie. Another hike along the John Muir Trail by Peter; mainly solo. 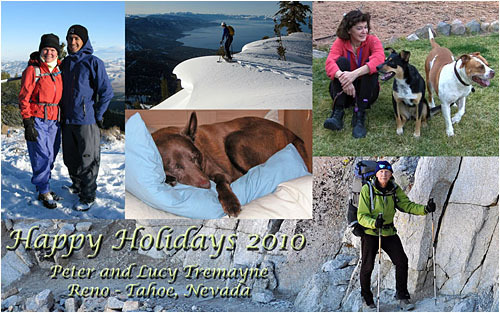 Heidi and Bill Tremayne visited frequently for hikes around and above Lake Tahoe. Lucy busy with study and caring for dogs. A year of visits, marriages and a final summer of travel for The Rickster, who died in December at the grand old age of 19. 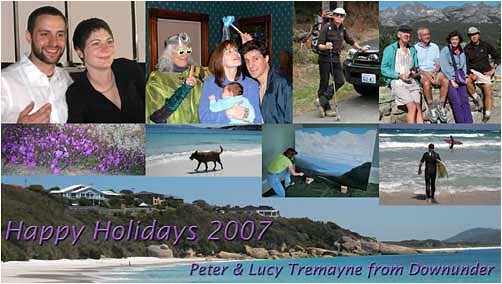 A year of big changes: Peter and Lucy sell their beach property in Western Australia and return to the USA on a permanent basis. We now reside in the Nevada mountains between Reno and lake Tahoe. 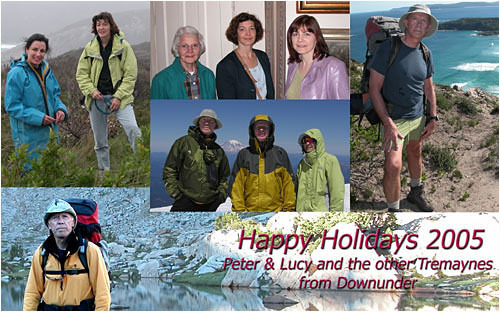 In late July, family and friends gather in New Zealand to celebrate the life of David, Peter's only sibling. On 5 November we realize it's not only Guy Fawkes night, but alas ... it's the end of the world as we know it! A year of glad tidings: Jordan and Simone are married in Portland, Oregon on June 27. Lucy's sister Ellen and her husband Bob are blessed by the arrival of son Robin. Two visiting Aussies, Mal Hill and Mike Fox, spend six weeks with us on a climbing/hiking adventure in the mountains of Washington and California. A year of bears, dogs, pumpkins and silly hats. Lucy completes her masterpiece tapestry, The Pumpkin Maiden, for the high kitchen wall of the same color in our Albany house. Coastal hikes on the Bibbulmun Track from Walpole to Albany in West Australia. Mal Hill visits Vancouver for climbs on Rainier, Goat Rocks and a summit traverse of Mount Adams. Peter and Lucy visit New England for time with Lucy's family and friends. Another hike along the John Muir Trail in California.